Not much time for an entry tonight. We'll be on the road at the crack of nuts tomorrow, 6:45 a.m.
which of course, is 3:45 a.m. back home in the Trans-Sierra. What a day. We spent about four hours at the Atlanta History Center looking over their amazing artifacts. Gordon Jones pulled out some highlights from the Wray collection -- at least the more portable ones -- and told some fascinating tales about their background, and provenance. Unless they're being aimed in my direction, I am not a person who gets overly excited by firearms. But some of the pieces Wray collected are pretty spectacular. Besides having an example of virtually every rifle and revolver used during the war, there are the rare prototypes, and crowd-favorites like a Whitworth with a side scope. Looking back, I was most excited to see one of the logbooks of the C.S.S. Shenandoah. I have read about this item here and there, and was excited to see it on display. The place is a treasure-trove, and the exhibits, both in conception and presentation, are impressive. The AHC is fortunate to have Jones as curator. His passion for his work was infectious. Fourteen years ago, when Ted Savas and I published The Campaign for Atlanta & Sherman's March to the Sea, vols. I & II, two of the historians who made that publication worthwhile were Steven Woodworth ("A Reassessment of Confederate Command Options During the Winter of 1863-1864") and Stephen Davis, "A Reappraisal of the Generalship of General John Bell Hood in the Battles for Atlanta"). Tonight, all these years later, I met both men for the first time. Dr. Davis gave a stirring and humorous introduction of Dr. Woodworth, after which Woodworth gave a great talk touching on many of the themes sounded out in the essay named above. Can't wait to hear Davis speak Saturday night on Johnston and Hood. I also met author Russell Bonds for the first time, and reconnected with Greg Biggs, reminiscing about memorable West Coast CWRT Conferences of days gone by, in particular an especially successful one themed "Hollywood in the Civil War," hosted by the Long Beach CWRT many years ago. Much spirited repartee followed Woodworth's talk, as he earnestly tried to make good on a promise to insult just about everyone's favorite general officer at one point or another before the evening was out. "Well you can drop me off on Peachtree I got to feel that Georgia sun"
Flew into William B. Hartsfield on Wednesday afternoon, caught a ride with my sister and brother-in-law all the way across town to the hotel, had a steak for dinner, and am now settled in to a comfy room with a refrigerator and a high speed internet connection. The records indicate that Uncle Billy burned this city to the ground, but as my friend Steve says, apparently "it didn't take." The city goes on forever in every direction. Thursday afternoon we kick off our annual meeting at the Atlanta History Center where Gordon Jones will pull out some select items from the George Wray Collection, which is not yet on exhibit. More on that in the next entry. Thursday night Steven Woodworth will give a talk. He is en route from TCU to Lynchburg, Virginia for a seminar there, but agreed to add a third leg to his air travel and stop over in Atlanta for one night. 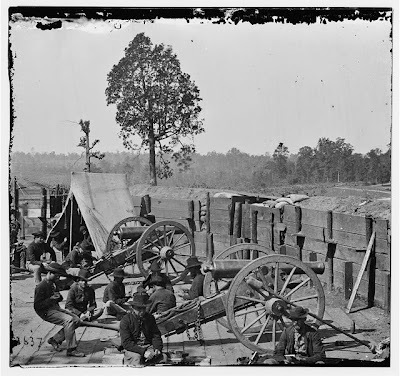 I intend to post a blog entry each night for the rest of this week, recapping the day's events and some highlights as we work our way down from Resaca on Friday, and finish off with the Atlanta Cyclorama on Sunday morning. Unfortunately I forgot to pack the cable for downloading photos from my camera, so the slide show will have to wait until next week. 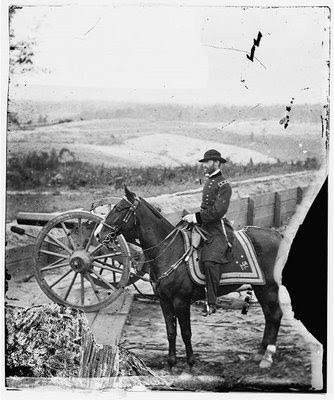 Beginning one week from tonight, the Civil War Forum will hold its annual conference/battlefield tour in Atlanta. A handful of seats remain. See the previous blog entry for the bird's eye low-down. There’s still time to get one of the remaining seats on the bus for the Civil War Forum’s annual gathering (as of this post, two weeks to go, and ten seats open on a 55-passenger bus). This year we have another stellar lineup of guides and speakers to cover one of the war’s critical campaigns. Civil War Forum conferences remain an unparalleled bargain—the most authoritative guides, two full and two half days of tours, three dinner presentations, and two lunches—for significantly less than for-profit tours (see registration info below). EVENING EVENTS: As repeat attendees know, and newcomers will discover, we begin gathering in the hotel conference room each evening (Thurs., Fri., Sat.) for an informal reception between 6:00-7:00 p.m. This is a great time to have a glass of wine or Rebel Yell, mingle with your fellow attendees, check out the donated raffle items, and study maps of the forthcoming tours. At 7:00 p.m. we’ll sit down to a catered buffet, before enjoying a talk by one of our featured speakers. -> Thursday: Dr. Steven Woodworth of Texas Christian University, author of Decision in the Heartland: The Civil War in the West, Jefferson Davis and his Generals: The Failure of Confederate Command in the West, and many other important Civil War studies. -> Friday: Dr. John Fowler of Kennesaw State University, author of The Confederate Experience Reader, and Mountaineers in Gray: Nineteenth Tennessee Volunteer Infantry Regiment, C.S.A. -> Saturday: Dr. Steven Davis, noted Atlanta Campaign historian, author of Atlanta Will Fall: Sherman, Joe Johnston and the Yankee Heavy Battalions, and numerous articles and essays, and long-time book review editor of Blue & Gray Magazine. 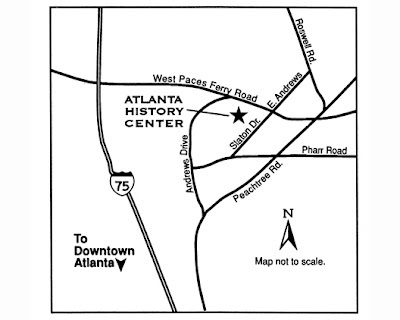 Thursday afternoon, March 27: 1:00 p.m. to 4:00 p.m: (via carpool) Atlanta History Center. For the first hour, Director Gordon Jones will give us a private presentation in the auditorium with a display of some of the treasures from the spectacular George Wray collection, then will turn us loose to view the Turning Point gallery—he'll remain on hand to answer questions. The Wray and Turning Point collections rank with the best collections of Civil War artifacts in the nation. Friday, March 28: 7:00 a.m: —Reseca to Kennesaw—First of all, a word of warning: this will be the longest day of the weekend. I have tried to strike a balance between seeing the critical fields of this campaign, and not running everyone ragged. That morning we'll board the bus bright and early and head straight for the battlefield at Resaca, there to meet up with local volunteers for interpretation, including Ken Padgett, president of the Friends of Reseca. We'll see the earthworks at Fort Wayne where the first shots of the battle book place, get an overview of the proposed park, and visit Snake Creek Gap—the subject of innumerable, and interminable internet arguments between detractors and defenders of Sherman and Thomas. Most of the preserved 550-acre Resaca battlefield site is un-improved, without even roads, and to see the entrenchments requires a half mile walk followed by a vigorous climb through heavy woods. Next time we visit, hopefully the access will be improved. From there we'll work our way to Pickett's Mill to see one of the most pristine Civil War battlefields in the country, and the scenes of savage slaughter. State Park historian James Wooten will be our guide for the Pickett's Mill portion of the morning. We'll have lunch at the picnic area there. After lunch, we'll follow one of the main historic routes, heading east on Due West Road toward Kennesaw Mountain, pass Gilgal Church, and make a stop at Pine Mountain for a few words at the site of the death of Lt. Gen. Leonidas Polk. Soon after we'll stop at the Kennesaw Mountain National Battlefield Park Visitor Center, there to see a very good (20-min.) interpretive film, and spend about 45 minutes looking at what Ed Bearss says is the finest Civil War museum at any of the National Park sites. You'll be able to satisfy your bookstore fix here as well. National Park Service historian Willie Johnson will guide us for the rest of the afternoon. The museum exhibits contain a lot of text, and the majority of the artifacts on display are site related, many ID'd to participants in the battle, so we'll take our time with that. From there, we'll bus to the top of the mountain to get an understanding of the terrain, before heading over to Cheatham Hill and other points. Saturday, March 29: —Chattahoochee River Line, Battle of Peachtree Creek, Battle of Atlanta—We are fortunate to have Charlie Crawford, highly regarded tour guide, and president of the Georgia Battlefields Association, as our guide for the full day on Saturday. Steve Davis and Gordon Jones will also be on the bus to add color commentary. 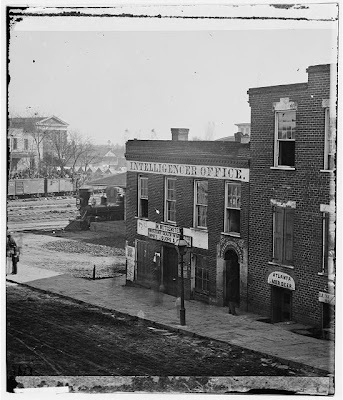 Our rough itinerary for the day: we'll begin with the Fort Drive Shoupades or Vinings Hill, from which Sherman first saw the church spires of Atlanta, and visit at least one of the Chattahoochee crossing sites: Paces Ferry or Powers Ferry. We'll do a drive-by of some of the Confederate Outer Line (Loring Heights, which was part of the starting position for the Peachtree Creek assault), and also drive through Brookwood Hills to see the Confederate initial advance, then follow 28th Street to see the Stevens marker, and stop at Tanyard Creek Park for the bulk of the commentary about Peachtree Creek. Later, in the Battle of Atlanta area, we'll see the Walker monument, and stop at the McPherson monument to explain the struggle for Leggett's Hill. We'll also stop at the Carter Center and walk to the site of the Confederate breakthrough on the afternoon of 22 July 1864. Sunday, March 30: (via carpool) Optional outing to 1) historic Oakland Cemetery to see the graves of several notable residents, including that of General John B. Gordon, and Margaret Mitchell. 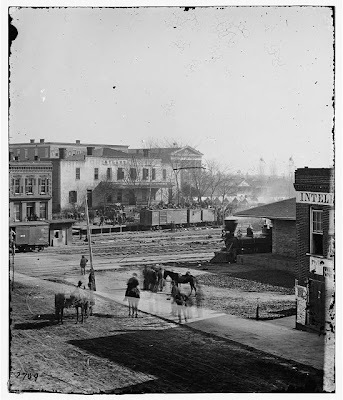 From there we'll head to 2) the Atlanta Cyclorama for a guided tour (including the Cyclorama painting, and the locomotive Texas – the locomotive that chased the General in the Great Locomotive Chase). At this last stop, I'll need people to pay their own entrance fee: for our group, it will be $6 per person [entry fees at Pickett's Mill, Kennesaw NBP, Southern Museum, and Atlanta History Center are including in your registration]. At approximately noon, we'll call it quits until next year. HEADQUARTERS: Comfort Suites Hotel • Perimeter Center 6110 Peachtree Dunwoody Atlanta, GA 30328 Tel: 770-828-0330 http://www.atlantacomfortsuites.com/ Cost: $250: includes all tours, three evening dinner presentations, two box lunches, entrance to all parks and museums (except Cyclorama on Sunday morning). Does not cover your lodging. Registration can be made by PayPal (request an invoice: civilwarforum@mac.com), or by check or money order to David Woodbury, P.O. Box 19130, Stanford, CA 94309. The following books by our featured speakers can be pre-ordered by email (civilwarforum@mac.com), and picked up and paid for at the conference. Authors will personally inscribe your copies. Save on shipping, get a signed copy, and enjoy the opportunity to engage the authors in discussion. 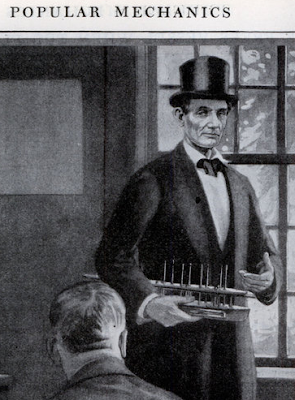 To this day, Abraham Lincoln remains the only president to get a patent—no. 6, 469, dated May 22, 1849—on one of his inventions. 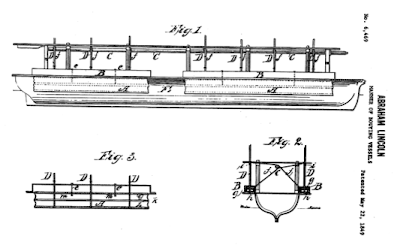 When he was president, Lincoln made a trip to the United States Patent Office to get another look at the scale model that had accompanied his patent application. The original drawing of his invention was rediscovered in 1997, missing the president's signature. Smithsonian Magazine published a brief article on the president's invention back in October 2006, wondering whether Lincoln built the scale model himself, or hired someone to do it for him. The precise source of the model of the flotation device is unclear, though there's no doubt that the ingenuity behind it was Lincoln's. 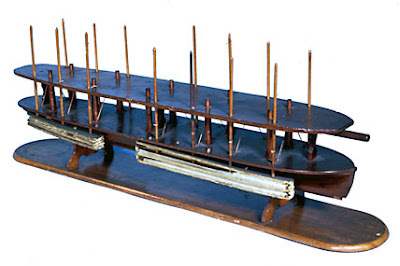 Herndon wrote about Lincoln bringing the wooden boat model into the law office, "and while whittling on it would descant on its merits and the revolution it was destined to work in steamboat navigation." A Springfield mechanic, Walter Davis, was said to have helped with the model, which was just over two feet long. But Johnston thinks it's possible that the detailed miniature Lincoln submitted may have been made by a model maker in Washington who specialized in aiding inventors. "The name engraved on top of the piece is 'Abram Lincoln,'" Johnston says. "It doesn't seem likely that if Lincoln had actually made this model, he'd have misspelled his own first name." 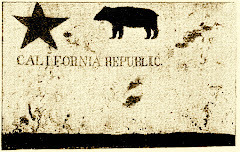 Johnston says that the answer—yet undetermined—may lie in whether the misspelled name is also engraved under the original varnish, indicating the model to be a commission. 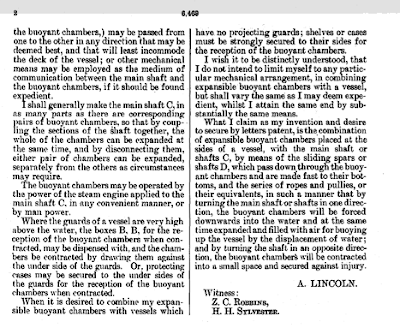 Since no one ever tried to put the invention to use, we can't know for sure if it would have led to the revolution in steamboat navigation that Lincoln predicted. But "it likely would not have been practical," says Johnston, "because you need a lot of force to get the buoyant chambers even two feet down into the water. My gut feeling is that it might have been made to work, but Lincoln's considerable talents lay elsewhere." Mechanix blog here. 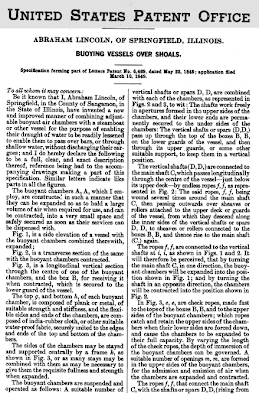 Below, specifications for patent 6,469 (click to enlarge).